Realizamos un estudio aleatorio a gran escala de los juegos de Math Snacks y obtuvimos resultados preliminares fascinantes que esperamos publicar a finales de agosto. En el otoño del 2013, 48 maestros de quinto grado en 14 escuelas en un distrito escolar urbano con bajos ingresos en el sur de Nuevo México se ofrecieron para participar de manera voluntaria en el estudio. Las clases se dividieron en dos grupos, con un grupo participando en actividades de Math Snacks por un periodo de cinco semanas mientras que el otro grupo continúo con la enseñanza tradicional. Luego se cambiaron los grupos para el segundo periodo de cinco semanas. Los miembros del equipo de Math Snacks han llevado a cabo actividades de investigación durante el proceso de cinco años, incluso investigación fundacional para orientar el desarrollo de las herramientas, extensas pruebas efectuadas por numerosos usuarios durante la creación de los juegos y animaciones, desarrollo profesional de los maestros que usan Math Snacks, e investigación sobre el impacto en los estudiantes. Chamberlin, B., Trespalacios, J. H., & Gallagher, R. (2014). Bridging research and game development: A Learning Games Design Model for multi-game projects. In M. Khosrow-Pour (Ed. ), Educational technology use and design for improved learning opportunities (pp. 151-171). Hershey, PA, USA: IGI Global. Kinzer, C., Wiburg, K., & Virag, L. (2010). University public school research partnerships in Mathematics. Border Walking Journal, 8(1), 61-69. Trespalacios, J., & Chamberlin, B. (2012). Pearl Diver: Identifying numbers on a number line. Teaching Children's Mathematics, 18, 446-447. Trespalacios, J. H., & Chamberlin, B. (2012). 21st Century learning: The role of serious games. In M. M. Cruz-Cunha (Ed. ), Handbook of research on serious games as educational, business and research tools (pp. 782-799). Hershey, PA, USA: IGI Global. Trespalacios, J. H., Trujillo, K., & Uribe-Flórez, L. (2014). Integrating educational animations to support common Core State Standards in mathematics classrooms. In D. Polly (Ed. ), Cases on technology and Common Core Mathematics Standards. Hershey, PA: IGI Global. Trujillo, K., Wiburg, K., Savic, M., & McKee, K. (2013). Teachers learn how to effectively integrate mobile technology by teaching students using Math Snacks animations and games. In J. Keengwe (Ed. ), Pedagogical applications and social effects of mobile technology integration (pp. 98-113). Hershey, PA, USA: IGI Global. Uribe-Flórez, L., J. , & Trespalacios, J. H. (2013). The role of animations and manipulatives in supporting learning and communication in Mathematics classrooms. In Y. Baek & N. Whitton (Eds. ), Cases on digital game-based learning: Methods, models, and strategies (pp. 400-410). Hershey, PA, USA: IGI Global. Wiburg, K. (2015). 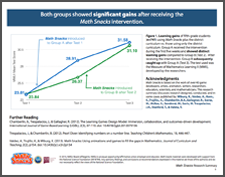 A promising game-based intervention for successful mathematics learning for all students. In D. Slykhuis & G. Marks (Eds. ),Proceedings of Society for Information Technology & Teacher Education International Conference 2015 (pp. 75-78). Chesapeake, VA: Association for the Advancement of Computing in Education (AACE). Retrieved April 23, 2015 from http://www.editlib.org/p/149970. Wiburg, K. & Chamberlin, B. A. (2014). Gaming/Virtual Worlds Arcade. NSF DRK12 PI Meeting, National Science Foundation, Washington, DC. (August 5, 2014). Chamberlin, B. A., Reischman, F., & Bardar, E. (2014). Meaningful Support for Teachers: Specific Ways to Encourage Game-Based Learning in the Classroom. NSF DRK12 PI Meeting, National Science Foundation, Washington, DC. (August 5, 2014). Wiburg, K. & Chamberlin, B. A. (2014). The Design and Findings of a Random-Controlled Trial for a Successful Game-Based Mathematics Intervention. NSF DRK12 PI Meeting, National Science Foundation, Washington, DC. (August 5, 2014). Chamberlin, B. A. (2014). How to design for how people learn. Extension Annual Conference, Washington State University, Spokane, WA. (July 9, 2014). Chamberlin, B. A. (2014). It's OK to play: How technology can be an important part of child development. EdNet Webinars, AWE, http://www.instantpresenter.com/edwebnet/EB52D687844B. (July 22, 2014). Chamberlin, B. A. (2014). Learning theory in app design. App Camp. Children’s Technology Review. Marshall, CA. Chamberlin, B. A. (2014). Math Snacks findings and teacher resources. App Camp. Children’s Technology Review. Marshall, CA. Chamberlin, B. A. (2014). Research-based design in children's media - Panel. Fred Forward. Pittsburgh, PA.
Chamberlin, B. A. (2014). You're pushing my buttons: What apps, games and social media mean to Extension. Extension Annual Conference, Washington State University, Spokane, Washington. (July 8, 2014). Chamberlin, B. A., Levy, A. & Stidwill, P. (2014). Learning to play: How to shape a good game. Sandbox Summit. Boston, MA. Chamberlin, B. A., Muise, A. S. (2014). User testing made easier. Casual Connect, Casual Games Association, San Francisco, CA. (July 24, 2014). Trujillo, K. & Johnson, S. (2014). Rates, ratios, and Ratey the Math Cat. National MidSchool Math Conference. Santa, Fe, NM. Wiburg, K. (2014). Math Snacks: Filling conceptual gaps in mathematics with innovative media. Society for Information Technology & Teacher Education International Conference. Jacksonville, FL. Buckleitner, W. & Chamberlin, B. A. (2013). Learning theory for software designers. Dust or Magic Institute for Development of Media for Children, Children's Technology Review, Lambertville, NJ. (November 3, 2013). Chamberlin, B. A. (2013). Careers in digital media. Colombia 3.0, International Game Developers Association, Bogotá, Colombia. (September 3, 2013). Chamberlin, B. A. (2013). How our games can change the world. Colombia 3.0, International Game Developers Association, Bogotá, Colombia. (September 5, 2013). Chamberlin, B. A. (2013). Learning theory in app design. Dust or Magic AppCamp, Children's Technology Review, Asilomar, California. (May 20, 2013). Chamberlin, B. A. (2013). Successful strategies for user testing: lessons learned in NMSU's Learning Games Lab. Colombia 3.0, International Game Developers Association, Bogotá, Colombia. (September 5, 2013). Chamberlin, B. A. (2013). You're pushing my buttons: How technology is changing the way our clients think, eat and play. Healthy Living Conference, Iowa Extension, Burlington, Iowa. (April 3, 2013). Chamberlin, B. A. (2013). You're pushing my buttons: how technology is changing the way our clients think and learn. Personal Finance Educators Conference, Maryland Extension, Annapolis, Maryland. (May 15, 2013). Chamberlin, B. A. (2013). You're pushing my buttons: how technology is changing the way our clients Think, work and learn. Western Extension Leadership Directors National Meeting, Cooperative Extension Service, San Diego, CA. (February 28, 2013). Chamberlin, B. A., Levy, A. & Stidwill, P. (2013). Getting your game into the classroom: 3 things serious game makers can do. Games for Change Festival, Games for Change Organization, New York, NY. (June 18, 2013). Trujillo, K. (2013). Math Snacks: Teaching the Math Practices using Animations and Games. National Council of Teachers of Mathematics Regional Conference. Las Vegas, NV. Trujillo, K. M. & Valdez, F. (2013). How Math Snacks and teacher practice impact student understanding of ratio and number line concepts. American Education Research Association. San Francisco, CA. Trujillo, K., and Aguirre, V. (2013). Math Snacks: animations and video games teaching middle school math. National Council of Teachers of Mathematics National Conference. Denver, Co.
Trujillo, K., McKee, K., Burns, A. (2013). Math Snacks: How animations and games can lead to conceptual understanding of middle school math. Jacksonville, Fla.
Wiburg, K. and Trujillo, K. (2013). 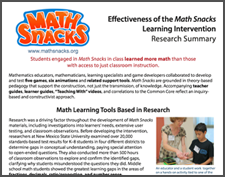 Do Math Snacks lessons increase students’ content knowledge? Yes. National Council of Teachers of Mathematics. Denver, Co.
Chamberlin, B. A. (2012). Grand challenges of app design: Math, communication and exploration. Dust or Magic App Camp, Children's Technology Review, Asilomar, California. (May 20, 2012). Chamberlin, B. A. (2012). How to make games, media tools and interactives that don't stink. Forum, Colorado Extension Service, Ft. Collins, Colorado. (November 7, 2012). Chamberlin, B. A. (2012). New technology tools: Communication and education. NMSU Extension In-service, NMSU Cooperative Extension Service, Albuquerque, NM. (January 12, 2012). Chamberlin, B. A. (2012). You're pushing my buttons: How games, apps and mobile technologies are changing the ways we think and learn. NM SIGGRAPH, Las Cruces, NM. (February 4, 2012). Chamberlin, B. A. (2012). You're pushing my buttons: How games, mobile devices and apps are changing the ways we think and learn. Arkansas 4-H Agents In-service Training, Arkansas State 4-H, Little Rock, AR. (August 9, 2012). Chamberlin, B. A. (2012). You're pushing my buttons: How games, mobile devices and apps are changing the ways we think and learn. NM Family and Consumer Science Association, Las Cruces, (March 10, 2012). Chamberlin, B. A. (2012). You're pushing my buttons: How technology is changing the way our clients think, work and learn. Annual Meeting, National Association of Extension Program and Staff Professionals, Denver, Colorado. (December 11, 2012). Chamberlin, B. A. (2012). You're pushing my buttons: How technology is changing the ways our clientele think, work and learn. Delaware Extension Program Conference, University of Delaware, Delaware State University, Dover, Delaware. (October 17, 2012). Chamberlin, B. A. (2012). You're pushing my buttons: How technology is changing the way we teach and learn. Middle School Math Science Conference, Texas Tech University, Lubbock, TX. (June 25, 2012). Chamberlin, B. A. (2012). You're pushing my buttons: How technology is changing the ways our clientele think, work and learn. Minnesota Extension Program Conference, Minnesota Cooperative Extension Service, Minneapolis, MN. (October 9, 2012). Chamberlin, B. A. (2012). You're pushing my buttons: How technology is changing thought, work and play. National Extension Directors' Meeting, Ft. Lauderdale, FL. (March 14, 2012). Chamberlin, B.A., Gleason, J. B., & McVann, J., (2012). Educational media: When you need a game, a website, an app or a video, and how to know when you need all of the above. Association for Communications Excellence International Conference. Annapolis, MD. Gleason, J. B. & Chamberlin, B. A. (2012).Games, simulations and interactives: Strategies for designing eXtension learning tools. eXtension 2012 National Conference, Oklahoma City, OK.
Savic, M. (2012). Math Snacks in the Middle School Classroom. Middle School Math and Science Conference. Lubbock, TX. Trujillo, K. & Aguirre, V. (2012). Math Snacks - How animations, activities and assessments meet the common core. New Mexico Math and Science Conference. Albuquerque, NM. Trujillo, K., McKee, K., Trespalacios, J. H. & Aguirre, V. (2012). Learning about the Coordinate Plane through game based learning: A case study on Math Snacks Summer Camp 2012. Rocky Mountain Education Research Association Annual Conference. Las Cruces, NM. Chamberlin, B. A. (2011). Game-based learning with the iPad. College of Education iPad Training, New Mexico State University, Las Cruces, NM, (August 26, 2011). Chamberlin, B. A. (2011). Helping developers create quality media. Roundtable on Quality Media, Fred Rogers Center, PBS, Arlington, Virginia. (October 3, 2011). Chamberlin, B. A. (2011). Math Snacks - Meeting new science objectives through gaming. National Science Foundation PI Meeting, Washington, DC. (December 5, 2011). Chamberlin, B. A. (2011). New technologies for new audiences: Twitter, Facebook and other social media in our programs. Family Resilience Conference, DoD/USDA, Chicago, IL. (April 2011). Chamberlin, B. A. (2011). Pushing my buttons: How the iPhone, Facebook, Wii, and other technologies are changing the ways kids think, work, and succeed. NEAFCS Annual Session, National Extension Association of Family & Consumer Science, Albuquerque, NM. (September 30, 2011). Chamberlin, B. A. & Garza, M. (2011). The computer in your hand: Do you need a smartphone, iPad, mobile device, or game system? Family Resiliency Conference, DoD/USDA, Chicago, IL. (April 2011). Chamberlin, B. A. & Gleason, J. B. (2011). How to create media that doesn't stink: our secrets for reaching eXtension clientele with games, web and video. eXtension Community of Practice Meetings, Louisville, Kentucky. (June 29, 2011). Chamberlin, B. A. & Gleason, J. B. (2011). Their computers are in their pockets: How games, smart phones, and mobile devices are changing the way our clientele learn. Association for Communications Excellence Conference, Denver, Colorado. (June 12, 2011). Chamberlin, B. A. & Gleason, J. B. (2011). User Testing — Easy strategies for making stuff that doesn't stink. Association for Communications Excellence Conference, Denver, Colorado. (June 12, 2011). Trujillo, K. M. & Savic, M. (2011). Math Snacks: How animations and games can be used in middle school mathematics. Society for Information Technology and Teacher Education, Austin, TX. Trujillo, K. M. & Savic, M. (2011). Math Snacks: How animations and games can be used in middle school mathematics. Society for Information Technology and Teacher Education, Austin, TX. Trujillo, K. M. & Savic, M. (2011). Math Snacks: Use animations and games to teach middle school mathematics tomorrow. NCTM Regional Conference, Albuquerque, NM (November 2011). Trujillo, K. M., Savic M. & Stanford, T. (2011). Math Snacks: How animations and games can be used to teach middle school mathematics. ISTE Model Lesson, Philadelphia, PA. (June 2011). Chamberlin, B. A. (2010). Gaming to Learn Panel. K-12 Discovery PI Meeting, National Science Foundation, Washington, DC. (December 2, 2010). Chamberlin, B. A. (2010). Multimedia Design Process: Making the bad stuff good. K-12 Discovery PI Meeting, National Science Foundation, Washington, DC, (December 2, 2010). Savic, M., Wiburg, K., Trujillo, K., & Stanford, T. (2010). Math Snacks: Using innovative media to address conceptual gaps in mathematical understanding. Hawaii International Conference on Education. Honolulu, HI.